Another offshore station which was eventually granted a licence to broadcast on land was Radio Hauraki - "home of the young New Zealanders", but before that they went through hell, high water and high seas to bring the listeners the kind of entertainment they wanted. 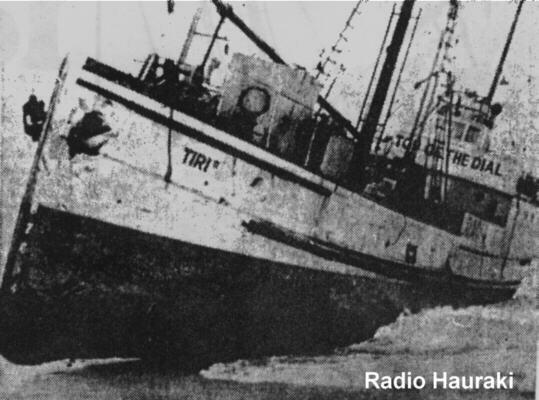 Two ships were used, the MV Tiri and then the MV Tiri II, after the first ship was wrecked in a storm. The station covered the Aukland area of North Island, New Zealand from its anchorage in the Hauraki Gulf outside territorial waters and broadcast a mixture of pop music with news bulletins every hour on the hour. Presentation was in a very personal and chatty style and, as with most of the British offshore stations of the sixties, presenters were free to project their own personality on air. The station broadcast on 1480 kHz with a reported power of only 2 kW which is low by our European standards but was normal for Australasian stations. The station closed down on 1/6/70 but was granted a licence to broadcast on land from Aukland and opened on 26/9/70 as 1XA. It quickly established itself as a top commercial station in the country. The museum has a 90 minute recording of a Radio Hauraki show and a superb 60 minute documentary detailing all the trials and tribulations of the station's history. 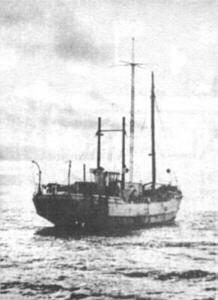 MV Tiri II at anchor in the Hauraki Gulf, New Zealand.